When I acquired the game the back glass was in fine condition, and the cabinet pretty decent. Nothing needed to be done with these, they were fine. I had repaired the game previously, so other than a blown fuse, the game did work and play. 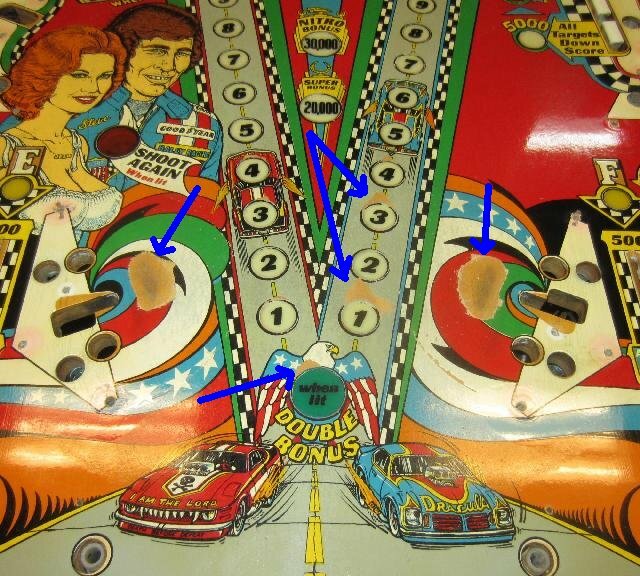 The issue was the playfield wear. 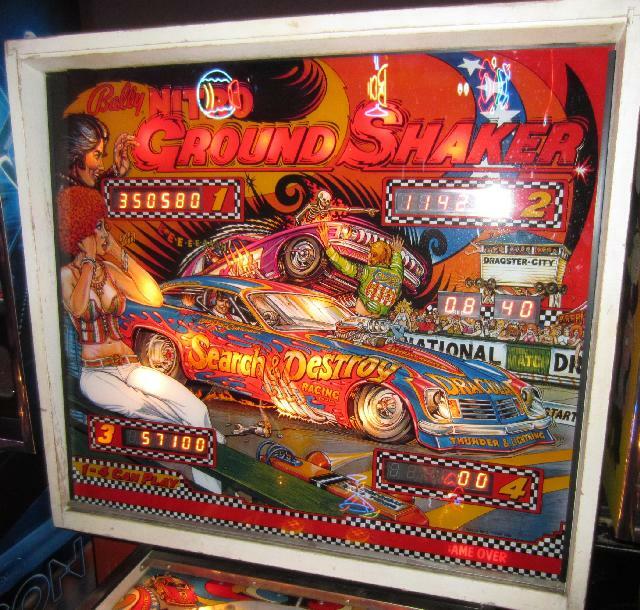 It’s hard to find a Bally Nitro Ground Shaker with a nice playfield, they always seem to have wear. This one was no exception, as you can see from the picture below. To make matters worse, mylar was put over the wear spots. 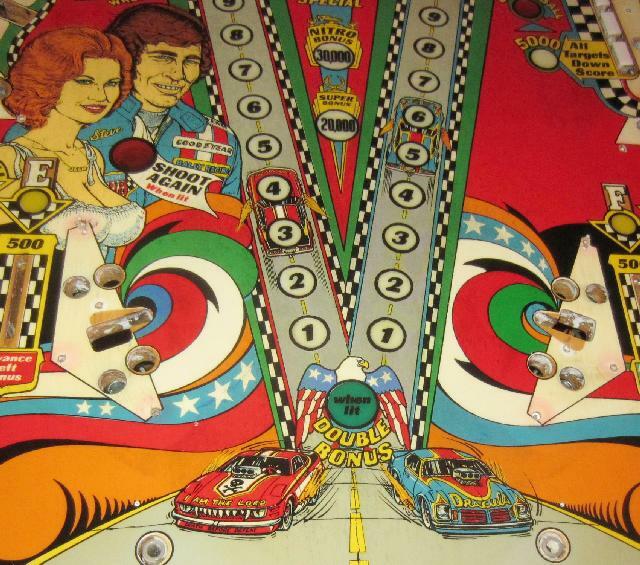 Before the playfield could be touched up, this mylar had to be removed. 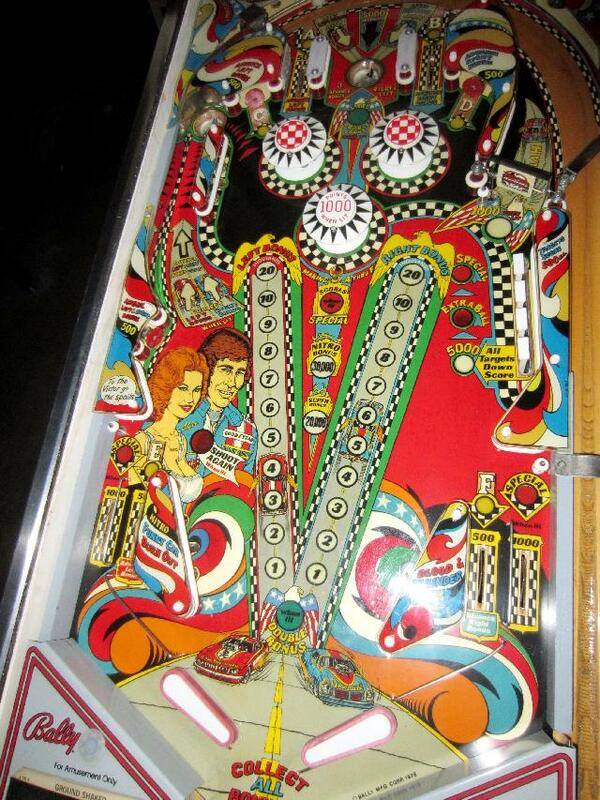 Luckily some freeze spray froze the mylar so it released from the playfield without taking any paint with it. The mylar glue was another chore. I used lighter fluid and some flour and “rolled” the mylar glue off the playfield. I had never done that before, so I was curious to see how it worked. Amazingly is it worked pretty well. Just keeping it wet with lighter fluid, the glue rolled up with my fingers. Sure it was some work, but not that bad. The flour seems to increase traction on the glue. Did it help more than just rolling it up by hand? Not sure, but it was worth trying. After much experimentation with color selection, I finally came up with the following colors to be used on the playfield. Though not perfect matches, it was acceptable enough, assuming I didn’t have to blend. If you color from black key line to key line, the color can be close but doesn’t need to be exact. That worked great for all the colors except for the gray, which had considerable wear up the two vertical bonus ladders. The gray was a problem because it needed to be blended. I used an interesting technique of “finger painting.” First I would apply the gray in a whole matter. Then using my big fat finger, I would splotch the newly added gray paint. This brings up some of the paint, allowing the original gray underneath to wash through the new gray. This really makes the blend nice, and it came out great. The red, green, blue and white were easy to touch up in comparison, because those could be painted from black key line to key line. When done all the black key lines are touched up too. 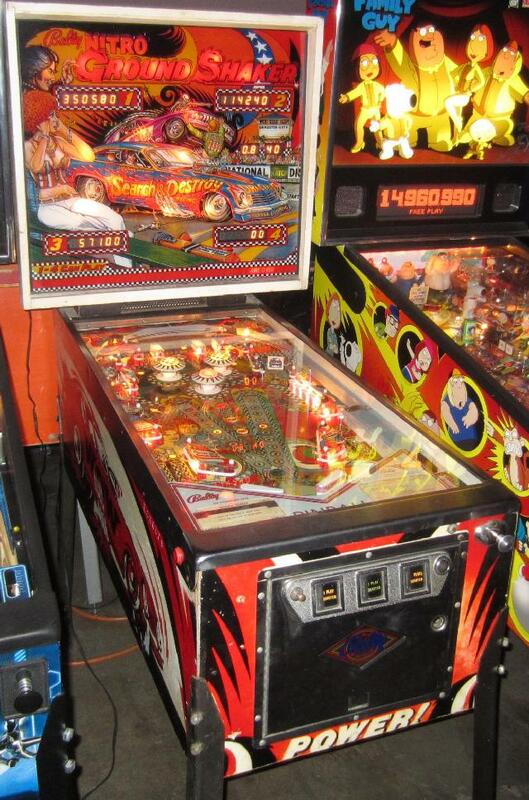 This gives a very clean and new look to a 30+ year old playfield. After all the touch ups are done, the entire playfield is clear coated with a two part automotive urethane. This blends everything together, making the touch ups far less noticeable. Then all the parts were installed, and the game really came together. The playfield is really smooth with the new clear coat, and it plays great. Overall the game came out great. The final thing was to add new firmware. One problem with Nitro Ground Shaker is the uneven scoring. The upper left kickout hole, which gives the bonus, is too much. The new software softens this, and makes the scoring much more balanced. It really helped the game play.